Press Any Key were led by Rob Russell, talented brother of the After The Fire guitarist John Russell. Rob's career included bands such as The Sun and Cripple Chicken. He spent some time as an evangalist and was almost arrested for being a public nuisance whilst singing "Sweet Sweet Song of Salvation". It was not the first time that Rob and John had played together, they toured earlier in a band called Starship between 1973 and 1976. The bands first gig was The Squirrels pub near Guilford, and was meant as a warm up for the oncoming 1983 Greenbelt festival, but around 500 people turned up. Shortly after Greenbelt the band played Dingwalls with around 250 supporters in attendance (including Pete Banks and Pete King). In Feb 1985 the band had 4 tracks played on the Radio 1 show Into The Music. 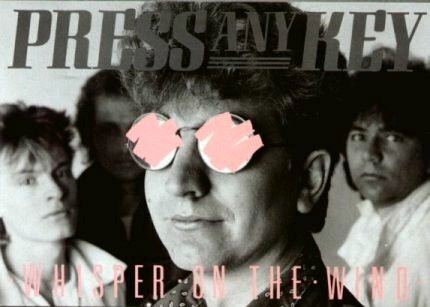 Shortly after the band released a 3 track cassette containing Whisper on the Wind, The Strangers and She Looks, He Looks through the fan club. In 1986 the band released the album Whisper on the Wind through the now defunked Marshall Pickering Record Label.